What is a Live Online Class Session in German 2? 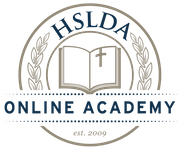 In every HSLDA Academy course, students meet weekly with their instructor and classmates in an online classroom for additional teaching, discussion, Q&A, or group activities. The class sessions are interactive and are conducted using a web meeting software with video, audio, chat, and application sharing capabilities. Scheduled, real-time sessions in the online classroom are not the only form of instruction available in a HSLDA Online Academy course, but are offered in addition to lectures or other instructional materials that students are able to access online at their convenience. When they register, students will need to select a particular class section and live class meeting time. Additional class sections may be added to the schedule at a later point in the course registration period. Registered students will be notified of any changes to the live session schedule. AP, Advanced Placement®, and SAT® are trademarks registered and/or owned by the College Board, which was not involved in the production of, and does not endorse, this product.